When I started to seriously collect, and research films, it was the SF of the 50s that initially drove my interest. I responded to the contrast of the straight backed logical scientist hero versus the atomic chaos of something that should not exist. There was certainly a formula for these films established in a large part by The Thing from Another World (1951). 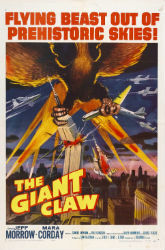 The Giant Claw is by-the-numbers 1950s monster movie that highlights the particular strengths and weaknesses of the era. Mitch MacAfee (Jeff Morrow) witnesses something a big as a battleship during radar test flight. Jets are sent after the object, but one goes missing. The military blames Mitch but more planes start disappearing. The mysterious object is revealed to be a massive bird that can fly at supersonic speeds and loves to eat people. To make matters worse, it’s surrounded by a force field that no weapon can penetrate. Mitch and his mathematician girlfriend, Sally Caldwell (Mara Corday), struggle to find a way to take down the monster’s shield before if kills more people. The Giant Claw’s biggest problem is right out front. There is no escaping the fact that the titular monster (which has a giant everything, I’m not sure why its claw gets singled out.) is ridiculous looking. It’s in stiff competition with the killer traffic cone of It Conquered the World (1956) for silliest looking monster of the 1950s. If you can forgive this unfortunate looking beast, or even learn to love it, you’ll find one of the more interesting monsters of atomic age. I enjoy how it plays off the flying saucer craze by being mistaken for a one initially. There are some tantalizing ideas that it comes from an antimatter galaxy. It’s also a vicious opponent, gleefully destroying trains filled with people and gulping down pilots who though they were parachuting to safety. There’s also the notion that Mr. Giant Claw is La Carcagne, a giant winged wolf-headed woman from folklore. Very cool, but maybe a bit beyond the pale for a 1950’s monster movie. Jeff Morrow makes what he can out of Mitch, the stereotypical square jawed 50s scientist. It was notable to see a female mathematician. Mara Corday as Sally, inevitably defers to Mitch by the time the credits roll, but up until that point she puts in the liveliest performance in the film. Everyone else fades into the mish-mash of generals and scientists that pervade this kind of film. The Giant Claw has a solid if formulaic story. There are endless scenes of the military fruitlessly trying to destroy the monster while the scientists race against time to develop a way to bypass its impenetrable force field. 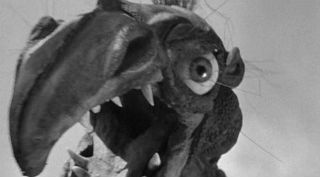 This sort of story was well established by 1957, and The Giant Claw is competent enough to hit all the necessary plot points without wasting much screen time. There’s nothing ground breaking here, but if you’re in the mood for straight forward atomic monster action, The Giant Claw works, even if the monster evokes more giggles than fear.